older Raunce and a flirtation begins. And it is Edith who discovers Mrs. Tennant’s daughter-in-law, whose husband is fighting at the front, in bed with a neighbor one morning, scandalizing the whole household. Henry Green (1905–1973) was the pen name of Henry Vincent Yorke. Born near Tewkesbury in Gloucestershire, England, he was educated at Eton and Oxford and went on to become the managing director of his family’s engineering business, writing novels in his spare time. His first novel, Blindness (1926), was written while he was at Oxford. He married in 1929 and had one son, and during the Second World War served in the Auxiliary Fire Service. Between 1926 and 1952 he wrote nine novels, Blindness, Living, Party Going, Caught, Loving, Back, Concluding, Nothing, and Doting, and a memoir, Pack My Bag. Roxana Robinson is the author of eight works of fiction, including the novels Cost and Sparta. She is also the author of Georgia O’Keeffe: A Life. A former Guggenheim Fellow, she edited The New York Stories of Edith Wharton and wrote the introduction to Elizabeth Taylor’s A View of the Harbour, both published by NYRB Classics. Robinson is currently the president of the Authors Guild. Loving’s drama (and its comedy, too) is the anarchy of uncertainty...serves nicely as a parable for our liminal political moment. In all of these novels we are made aware of the most profound and surprising truths about life, love and the human heart without being able to pinpoint any one page, line, or moment of epiphany. To read all three back-to-back is to find oneself in the presence of rare genius, fit to sit along Woolf, Fitzgerald and Joyce on anyone’s shelf of classics. 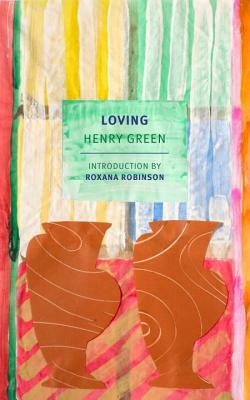 Henry Green is here to stay. This new edition...is cause for celebration...[Green] wriggles free of categories, the true strangeness of his prose not always evident until we slow down to see it has been hiding in plain sight.